Historians agree that some of the Roman military campaigns were motivated by the need to find and control ore reserves required for coinage. Monetary payments were made for a while using un-coined bronze called aes rude and cast bronze ingots called aes signatum. Rome eventually built its own mint and coined silver denarii and smaller coins of bronze.During Emperor Augustus’ reign, a gold coin called aureus was minted, which could be exchanged into silver denarii. Because the Greeks kept their silver drahms as a basis for their monetary system, money exchangers of various currencies were found in large cities. Constantine introduced the gold solidus as a counter measure to the diminished weight and metal content of coins of the third century A.D.
A treasure trove of Roman coins, imperial aurei and denarii, was found in India, proof of the trade in spices and pearls, but also evidence that Indian merchants were collectors who may have prized the Roman gold and silver coins enough to horde them. According to Strabo, 120 ships “sailed every year to India from the Red Sea” and each cargo was extremely valuable. Coins were not just a medium of exchange and store of value, but important means to advertise legendary figures, military campaigns and victories, buildings, roads, construction projects, and the image of the emperor. Julius Caesar was the first emperor to use his own visage on coins instead of the portraits of previous rulers as it was the custom. It was thus of great importance for Rome to find new gold and silver reserves in order to feed the need for precious ore to mint coins for the Roman Empire. Emperor Trajan, during his 19-year rule, managed to defeat in 105 A.D. the Dacians, a thriving civilization, the ancestors of the Romanians of today. Located north of the Danube River, the Dacians were a constant irritation, attacking and raiding the outskirts of the Roman Empire. Following two years of Dacians Wars after Trajan’s 101 A.D. invasion of Dacia and a negotiated peace which the Dacians immediately broke, the Romans attacked again in 105 A.D., crushed them with tens of thousands of troops, and returned victorious to Rome, bringing back a half million pounds of Dacian gold and one million pounds of Dacian silver, including a very fertile new province with massive fields of grain necessary to feed an imperial army. In May 2000, treasure hunters with metal detectors and exploratory knowledge found Dacian reddish solid gold bracelets and thousands of silver and gold coins buried at Sarmizegetusa, the former capital of the Dacian civilization. The stolen coins and 13 hammered bracelets weighing 27.5 pounds have been since recovered but Lot 26 is still missing. Individual coins have appeared for sale at various auction houses and online, ranging in price from $300 to $10,000. Learning from the recovered coins interesting aspects of the Dacians’ life and religion, archeologists also determined that the coins were crude copies of Greek coins and were never in circulation. 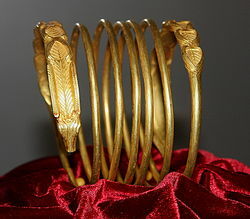 Likewise, the bracelets were never worn; they were made from local gold and buried into the ground for safekeeping. It is perhaps because of Trajan’s conquest and the subsequent colonization of Dacia by the Roman Empire that Romanians, surrounded by Slavic-rooted countries, speak a beautiful and complicated language that is closest to Latin of all six Romance languages and their numerous dialects: Italian, French, Portuguese, Spanish, Romanian, and Romansch (spoken in one of Switzerland’s cantons). When Sarmizegetusa, the capital of Dacia, fell and it was looted and burned to the ground by the Romans, its ruler, Decebalus, did not wait for the Romans to humiliate him into surrender; he committed suicide under an oak tree, as depicted by the top freeze of Trajan’s Column. The column is valuable historical evidence that has survived the fall of the Western Roman Empire in 476 A.D. It offers clues about uniforms, weapons, equipment, and tactical warfare, portraying Trajan as the victor and Decebalus as a worthy opponent but a vanquished leader. If you ever visit Italy, the number one pastime of tourists is to climb stairs of towers, churches, and edifices left from generations of builders who always tried to outdo each other’s life work in height and majesty. The fact that Trajan’s column and many other buildings have survived the numerous earthquakes of time, fires, and plundering is a miracle in itself. The column was not built for Dacians, it became a monument to display the power of the imperial war machine, “capable of conquering such a noble and fierce people,” said Meneghini. The Dacians who had survived were captured and sold into slavery. 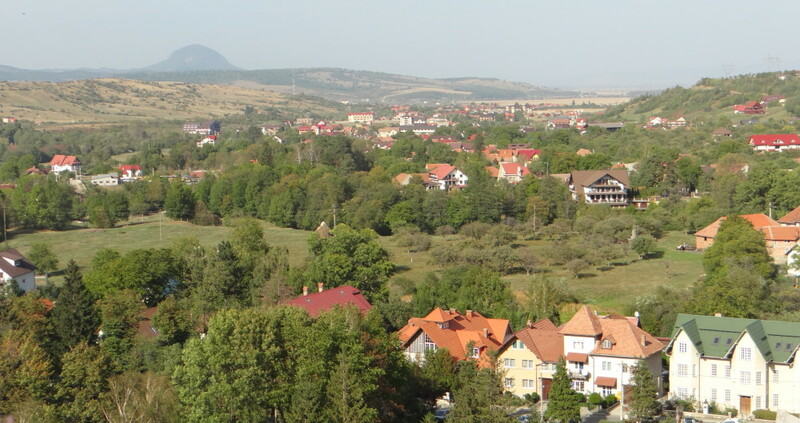 Given their tumultuous history and numerous occupations, including centuries of bloody battles, tribute to and plunder by the Ottoman Empire, and modern-day political corruption, it is easy to understand why Romanians today are so circumspect of any investors who are considering exploring and mining the gold reserves left in Roșia Montană and the potentially damaging environmental effects. This entry was posted in History and tagged Dacia, Dacian civilization, Decebalus, gold, Romanians, Sarmizegetusa, Trajan, Trajan's Column by Admin. Bookmark the permalink.